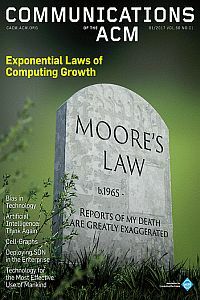 ACM’s flagship magazine, Communications of the ACM, is the premier chronicler of computing technologies, covering the latest discoveries, innovations, and research that inspire and influence the field. Each month, Communications brings readers in-depth stories of emerging areas of computer science, new trends in IT, and practical research applications. Industry leaders choose Communications to debate technology implications, public policies, engineering challenges, and market trends. Read by over 85,000 computing researchers and practitioners worldwide, Communications is recognized as the most trusted and knowledgeable source of industry information for today’s computing professional. Esimated Delivery: Foreign titles may take 8 -10 Weeks to start receiving first issue.